Double Edge is a project designed to prevent re-offending amongst knife and weapon offenders. Participants receive high impact education concerning the realistic dangers and consequences of carrying, using and being associated with people who endorse or promote weapon culture. The course can be adapted to fit a 6 to 12 week programmme of weekly 2-hour sessions, delivered to groups of up to 12 young people. Prevent re-offending through education and guidance. Provide accurate knowledge of the medical, legal and social implications of knife and weapon practices. Gain knowledge of alternative perspectives to weapons and weapon offenses through validated sources. Improve consequential thinking and ability to make informed decisions. 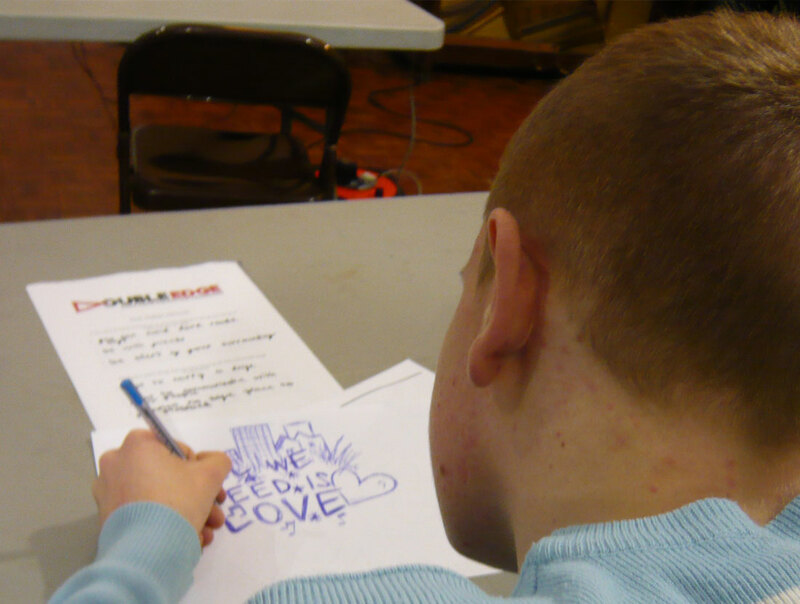 Double Edge stands out over similar projects because of the unique dynamic that our experienced delivery team are able to create, in which young people feel comfortable to speak honestly about their choices, discuss their thought processes and learn through engagement and participation. During the course participants will meet with lawyers/barristers, paramedics, police, ex-gang members, victims, and victim’s families. Their real experiences, shared through the structure of the programme provide validation for the knowledge shared. Double Edge sessions provide multimedia presentations and interactive learning activities that are designed to meet the needs of different learning styles and levels. This includes creative mediums of expression such as art, design, poetry and lyric writing when applicable. Funded by the Home Office through the End Gang and Youth Violence initiative, PYE has delivered over 24 cycles of Double Edge in partnership with Lewisham Youth Offending Service. Working with approximately 200 young people through this project since 2009. An evaluation of the project conducted in 2014 reported a success rate of preventing re-offending with knife or weapon.